It’s 2017 and it’s a great year to visit WDW. Let me count the reasons. 1, 2, 3, 4 … 17. There are 17 reasons! Well, there are lots more than that, but we’ll just focus on these 17. This “out of this world” fireworks spectacular, which recently returned to Disney’s Hollywood Studios. 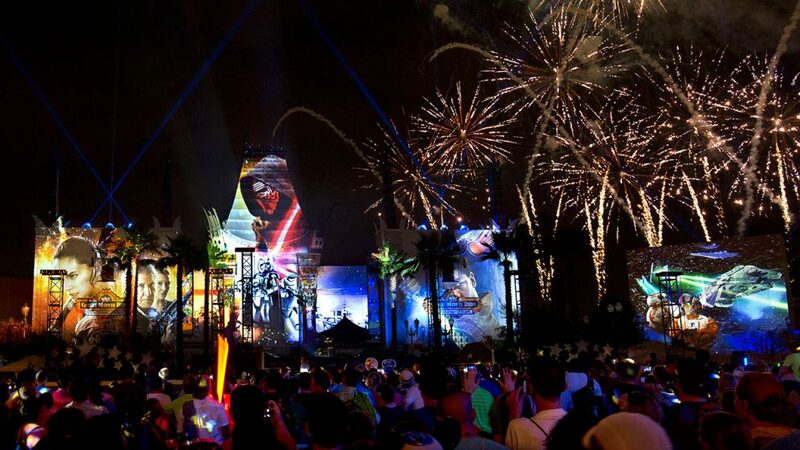 This uses the latest projections effects, lighting, lasers and pyrotechnics to light up the sky, Star Wars style. You can celebrate the newest cinematic addition to Star Wars, courtesy of an assortment of props from Rogue One, a Star Wars Story. I visited this attraction in September. There were lots of props from the Star Wars movies here. 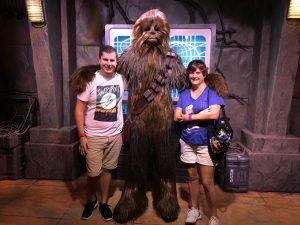 And let’s not forget you can take a pictures with the Star Wars characters! Chewy was a bit scary, but he gave me a big hug and I knew he was a sweetie! New Magic bands are rolling out! They will still offer the same helpful functions as the original bands. Stay tuned for more updates! This is seven-hour experience, is led by a Star Wars, know it all. Ha!! You will get an insider’s tour and meet characters at Star Wars Launch Bay; screen Star Wars Path of the Jedi” and enjoy Star Wars themed menu items at Backlot Express. The tour wraps at the Star Wars- A Galactic Spectacular Dessert Party, which includes reserved viewing for the show. Children ages 4-12 on the Guided Tour package can also train in the way of The Force in Jedi Training: Trials of the Temple. The price is $129 per Guest. This sound like so much fun?!! Disney After Hours returns to the Magic Kingdom Park on Jan. 20, 27, Feb. 2, 9, 16, March 2 and 9, 2017. This 3-hour event takes place after the park closes and is only open to a limited number of Guests, which means much shorter lines at 25 attractions, character greetings and more. The cost is $119 per adult or child (tax not included). Dozens of shopping and dining locations made their debt at Disney Springs in 2016 – and even more are set to open in 2017! Stay tuned for news and opening dates for Planet Hollywood Observatory, Paddlefish, The Polite Pig, The Edison and Wine Bar George. All of these sound so good!! It’s the 20th Anniversary of the Walt Disney World Half Marathon. And to celebrate, they’ve made Donald Duck their mascot. Also, in anticipation of the release of “Beauty & The Beast” this spring, runDisney has themed this year’s Princess Half Marathon after the film. Look for Beauty in the Beast in theaters in March! Epcot will start 2017 off with a bang, offering a brand new art festival for you to experience. This new offering will run weekends between Jan 13-Feb. 20, 2017 and will showcase visual, culinary and performing arts. This year’s spring festival will run March 1-May 29, 2017. Festival “firsts” include brand-new topiaries of Belle and Figment, two new outdoor kitchens and a “Cars” interactive play garden for kids in honor of the upcoming Disney Pixar film, Cars 3. During the Epcot International Flower & Garden Festival, dining packages will be available on select days at a number of Epcot restaurants, combining dinner and reserved seating for performances of the Garden Rocks Concert Series. Stay tuned for more details! Coming this spring, you can enjoy a new family-style raft attraction at Disney’s Typhoon Lagoon Water Park. Planned to be one of the longest Disney water park attractions, this experience will immerse you in the story of treasure hunter, Captain Mary Oceaneer. Scheduled to open at Disney’s Wilderness Lodge in summer 2017, Boulder Ridge Cove pool will feature an expanded sun deck and zero-depth-entry pool in what appears to have been an abandoned rock quarry. Geyser Point Bar & Grill, a new quick-service eatery, will be located in the heart of the feature pool area of Disney’s Wilderness Lodge. Well, that’s all the time we have for now… reasons 13- 17 will be part 2, coming soon!! I know, I’m leaving you hanging!! Trust me, it’s worth the wait. Until then, if you would like any help with your Disney adventures, contact one of our Travel Pixies. We’ll be happy to sprinkle the pixie dust and make everything extra special! 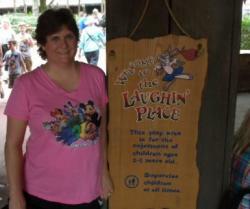 Previous PostUniversal Islands of AdventureNext PostEPCOT’s Flower and Garden Festival: Flowery Fun!